Seven persons P, Q, R, S, T, U and V are sitting in a straight row and some of them are facing north while some of them are facing south. They all attend their exams in seven different days of the same week starting from Monday to Sunday but not necessary in the same order. The one who attends the exam on Tuesday sits third to the right of V and neither of them sits at extreme ends of the row. V does not face south. The one who attends the exam on Friday sits second to the right of T, who is an immediate neighbour of V. Only one person sits between the one who attends the exam on Friday and the one who attends the exam on Wednesday. 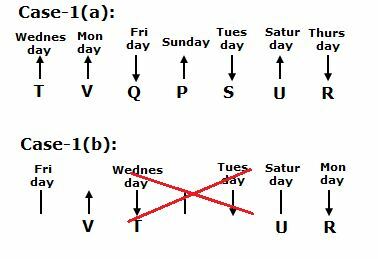 Only two persons attend the exams between T and U. U sits to the immediate right of R, who neither attends the exam on Friday nor on Tuesday. The immediate neighbours of the one who attends the exam on Saturday are facing the same direction. U does not attend the exam on first day of the week. The one who attends the exam on Monday sits second to the left of P, who faces the same direction as T. As many persons attend the exams between V and R is same as the persons sitting between U and Q. Q does not attend the exam immediately after V. Not more than two persons facing same direction sits together. 1. P attends the exam on which of the following days? The one who attends the exam on Tuesday sits third to the right of V and neither of them sits at extreme ends of the row. V does not face south. The one who attends the exam on Friday sits second to the right of T, who is an immediate neighbour of V. Only one person sits between the one who attends the exam on Friday and the one who attends the exam on Wednesday. 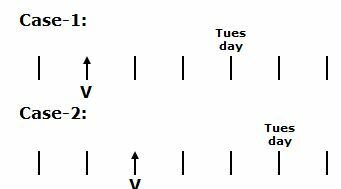 Only two persons attend the exams between T and U. U sits to the immediate right of R, who neither attends the exam on Friday nor on Tuesday. The immediate neighbours of the one who attends the exam on Saturday are facing the same direction. U does not attend the exam on first day of the week. The one who attends the exam on Monday sits second to the left of P, who faces the same direction as T. As many persons attend the exams between V and R is same as the persons sitting between U and Q. Q does not attend the exam immediately after V. Not more than two persons facing same direction sits together. 2. How many persons are facing south? 3. Which of the following pairs sits at extreme ends of the row? 4. How many persons attend the exam between P and Q? Directions (6- 10): In each of the questions below are given three statements followed by three conclusions number I, II and III. You have to take the given statements to be true even if they seem to be at variance with commonly known facts. Read all the conclusions and then decide which of the given conclusions logically follows from the given statements disregarding commonly known facts. 1) P attends the exam on which of the following days? 2) How many persons are facing south? 3) Which of the following pairs sits at extreme ends of the row? 4) How many persons attend the exam between P and Q?